A workgroup formed in the cabinet should present proposals for tax reform, fair tax payment encouragement and incentivising reductions in the black market economy by spring. Economist Rūta Vainienė stated that in terms of reducing the black market economy, she expects nothing significant. "Something from the typical assortment of measures will likely be presented," she said. Member of Seimas Ingrida Šimonytė was more optimistic. "If the cabinet chose to enact the programme of the party which formed it, I believe that it would be possible to find a means to reduce the black market economy," she said. There was much talk about the planned tax reform already in 2017. Nevertheless, the tax and social system improvement guidelines presented in summer were not as ambitious as expected. This year the cabinet intends to present new proposals. As the Ministry of Finance Department of Communication chief specialist Erika Bogusevičiūtė informed Delfi, currently a workgroup intended to prepare proposals for tax reform, fair tax payment encouragement and incentivising reductions in the black market economy has been formed as per Prime Minister Saulius Skvernelis' order. 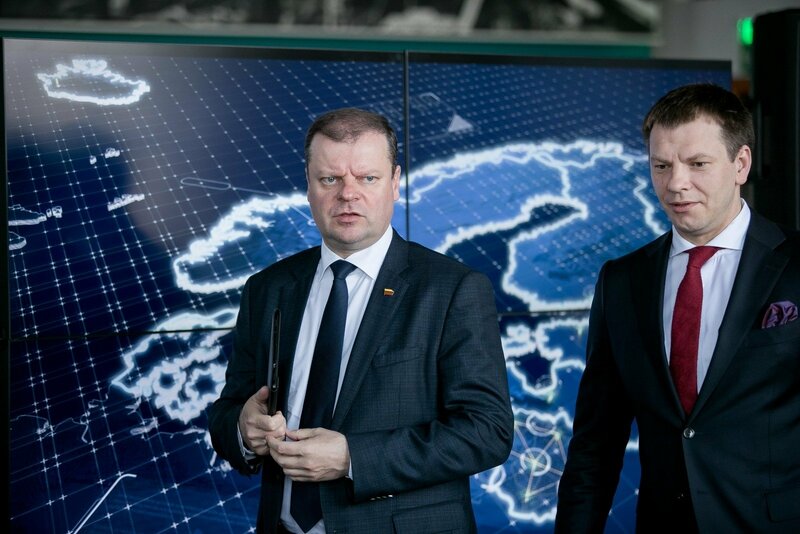 "The workgroup is formed from representatives of the Ministry of Finance, government chancellery, Ministry of Economy, Ministry of Social Security and Labour, Bank of Lithuania, State Tax Inspectorate [VMI], Sodra, Customs Department and Financial Crime Investigation Service. The workgroup should present the prime minister and the cabinet strategic project portfolio commission with relevant proposals by mid spring," she outlined. The plans to reduce the black market economy are mentioned in the government programme implementation plan. For example, it was planned to create and implement tax calculation services for small business in 2018 – create the conditions to perform semi-automatic tax and expense accounting; improve cash register systems in respect to modern payment and accounting means and the functions of the smart tax administration system (IMAS); set proportionate sanctions for breaches of tax legislation. Last year featured the beginning of the receipt lottery that was intended to help combat the black market economy, where only receipts from markets and for services are eligible for participation and winners are awarded prizes of 200 or 5000 euro. Ten winners are granted 200 euro per week and one per month – 5000 euro. Austrian Johannes Kepler University Linz professor Friedrich Schneider has earlier told Delfi that according to his calculations, in 2017 the black market economy formed approximately 21% of Lithuania's GDP, almost 9 billion euro. R. Vainienė said that she does not expect any measures targeting the black market economy because, according to her, the black market is largely due to significant taxation, reductions of which are not planned. "Due to excises contraband goods form around a third of the shadow, due to Sodra payments (not income tax or mandatory health insurance), specifically due to Sodra there are off the books payments and then there is also the VAT with its 21% tariff which draws a massive amount of funds into the shadow. The VAT was raised and forgotten, everything is heading in a completely different direction with Sodra as well – they are increasing its coverage, so that as many as possible would be involved and would pay," she stated. I. Šimonytė does not concur with this view. "The black market would be most reduced by lowering taxes to 0. Then we would have no black market," she quipped. According to her, you can have both large taxes and a competitive economy. You can also have low taxation and poor competitiveness. "It is not the size of taxes that incentivises avoiding them. Primarily it is linked to a perception, people's belief that what we as a society receive is more or less justified and the burden is distributed among us more or less fairly. How can there be large taxes in Scandinavia? What are they, not normal? No, simply the society there has the belief that there is need for healthy employees, education, infrastructure and such. If you consider that the returns from taxes paid are fair, then there is no questioning what the tax rates are," she explained. The former minister of finance added that funds gathered even with very low tax rates could be used ineffectively. "You can squander tax revenue with unfair public procurements, then it will also appear you are getting nothing in return. What difference does it make then that the taxes are low? The incentives remain the same. It is more a matter of infrastructure, institutions and government morals, which are far more subtle than the claim of "make taxes low and everyone will be fine," the member of Seimas said. R. Vainienė mused that the government workgroup will likely present something from the usual assortment of measures. "It will be restrictions on cash transactions, tax payer incentive increases: with the carrot of the receipt lottery, the "cherry" envelopes and such, with the stick of various fines. If they began punishing not just, say the cigarette salesman in the market, but also the buyer," she said. Indeed the VMI performs the most work. They currently have the most detailed information in real time, with which they perform comparative analyses, identify the main risk sectors and work with them. The International Tax Inspectorate Community aids them and the lottery or return of cash is, so to say the icing on the cake," R. Vainienė said. She also observed that the cabinet has truly not been overly focused on combatting the black market. "For example we know how it is with illegal enrichment – there is a legal tool where it is necessary to prove that the individual has more wealth than they earned in their life. Of course, there are people who have illegal income, perhaps linked with corruption, but that tool is being used to a fairly limited extent. On one hand, perhaps the legal procedure is difficult. On the other hand, what does it mean? It means that many Lithuanian citizens will need to be reviewed. For example, the black market is prolific in the regions. Many residents live off incomes that have not been taxed. The government has not been touching this area due to social reasons because otherwise these people simply won't survive," she said. I. Šimonytė believes that at least part of the incentives to hide work income would be removed by changes in income taxation. "The employee and employer Sodra payments should be merged and made more transparent. It should be distinguished where there is income tax and what is more or less insurance, speaking of the individual part of pensions (not the base pension) and such. This is the first and most important matter," she said. The opposition MP expressed hope that this year will not be limited to minor cosmetic proposals. "If they say once again that it is not present anywhere and thus is not necessary, then they will likely once more propose some minor cosmetic thing. For example to inform someone of the harm of not paying tax. I can hardly expect any major impact from this, but if the cabinet chose to enact the programme of the party which formed it, I believe that they could find means to reduce the black market economy," I. Šimonytė said.